How do fission and fusion reactions compare? In fission, energy is gained by splitting apart heavy atoms (uranium), into smaller atoms (such as iodine, caesium, strontium, xenon and barium, to name just a few) whereas fusion is combining light atoms, (in current experiments two isotopes of hydrogen, deuterium and tritium), which forms a heavier one (helium). Both reactions release energy which, in a power plant, would be used to boil water to drive a steam generator, thus producing electricity. Fission is triggered by uranium absorbing a neutron, which renders the nucleus unstable. The result of the instability is the nucleus breaking up (in any one of many different ways), in the process producing more neutrons, which in turn hit more uranium atoms and make them unstable and so on. This chain reaction is the key to fission reactions, but it can lead to a runaway process, as in a nuclear bomb. Fusion is a much harder reaction to achieve, however it yields more energy than fission. There is no chain reaction involved – hence there can not be an explosion – the reaction is achieved simply by getting the fuel hot enough and containing it tightly enough for the components to collide and fuse. The temperature has been achieved (over 100 million degrees), however confining the hot fuel plasma using powerful magnetic fields has taken a while to perfect. The behaviour of plasma is now well-understood, and so the building of a power reactor is simply a matter of overcoming engineering hurdles – work is expected to commence on the DEMO fusion reactor in 2030. How are only the impurities (particularly helium ash) removed, when they are all charged? Wouldn’t any sort of flow also take some of the plasma into the divertor? There is not a perfect confinement of the plasma; all plasma components (including the fuel – deuterium and tritium) diffuse across the magnetic field. This means that the divertor actually is receiving flow of all plasma components, ie fuel, helium ash, and impurities. Also, only a very tiny percentage of the fuel actually reacts, so there is not much “ash” (which is really helium gas) that need removing. To replace the lost fuel we keep supplying more into the vessel, and the fresh fuel (even when ionised) diffuses to the plasma centre. Additionally, we can supply some extra fuel to the plasma centre directly via pellet injection and neutral beam heating. We can choose magnetic field configurations which contain light elements better than heavy ones. This means that the helium and the impurities get pushed to the edges of the plasma, near the divertor where they get skimmed off. However we need to balance the removal of helium. When a He nucleus is born in a fusion reaction, it is very energetic – that is, very fast moving. Fast particles diffuse across the magnetic field more rapidly than slower plasma particles (with thermal distribution of velocities). So one of the challenges is to confine the fast helium particles well enough in order to allow them to lose their kinetic energy in collisions with fuel particles, thereby heating up the plasma. Only when the helium has lost its kinetic energy is it desirable that it diffuses out of the plasma in order not to dilute the fuel. When the extreme temperatures required for fusion can be sustained solely by the energy of its own helium production, then we have what is called a burning plasma. To date, we have only achieved these temperatures via external heating. At what point during the fusion process do the helium nuclei stop adding to plasma heating and become an impurity? About 20% of the net energy gained from the fusion reaction is carried by the newly-created helium nucleus – the remaining 80% is carried by the neutron which, because it is not charged can escape the confining magnetic field. The net energy gained by the helium ions will remain within the plasma and, through collisions with the deuterium and tritium fuel ions, will be transferred to these fuel ions, maintaining the high temperature required for the reaction to occur. This effect has been observed and verified on JET (the only existing device to observe fusion power being produced from a magnetically confined plasma). After a number of seconds the helium ions have slowed down (through these collisions) and can no longer heat the plasma. At this stage they essentially become an impurity to be removed – in fusion research this helium is known as helium ash. The removal of this helium has been one of the major challenges facing the realisation of fusion energy from devices like JET. The basic approach is to form a D shaped plasma which touches the bottom of the vessel in an area known as the divertor. The helium ions will naturally (like all ions) move to the edge of the plasma, where a powerful flow will transport them to the divertor – where they will be pumped away. What does strong force have to do with the energy released by the tritium-deuterium fusion reaction? Physicists have worked out that all the interactions in the universe are governed by four different forces, only two of which we see in every day life: gravity and electromagnetism (sometimes called the coulomb force). The other two, imaginatively named the “strong” force and the “weak” force come into play only at very short range and mostly operate within the nuclei of atoms. When nuclei bind together in a fusion reaction, it is because the strong force is attracting them. The helium nucleus which results from deuterium and tritium fusing is more tightly bound together by the strong force; in the process of fusing, energy is given out. Compare this, say, with gravity: a meteorite falling to earth picks up energy as it falls. The complication with fusion is that the two constituents of the reaction are positively charged – so they repel each other, electrostatically. (Note they also attract each other due to gravity, but that is a much weaker effect than the electromagnetic force). The electromagnetic force is in turn much weaker than the strong force, as long as you get the deuterium and tritium nuclei close enough – once they are close, the strong force lives up to its name and pulls the nuclei together, overcoming the electrostatic repulsion. Although it operates over only small distances, it is a much larger force than the electromagnetic force: this is why the amounts of energy given out in nuclear reactions are so large. Has there been much research into more controlled methods of bringing nuclei together in fusion? For example, head on ion beam collision? Incredibly high temperatures and pressures to produce “random” collisions resulting in fusion seems difficult to sustain, and to have limitations. Has there been much research into more controlled methods of bringing nuclei together in fusion? For example, head on ion beam collision? It is true that the fusion collisions in the plasma in a tokamak are essentially random, although due to the high plasma ion temperatures, these collision are quite frequent. The big challenge is to maintain the high temperature in these plasmas for a long enough confinement time (i.e. the time the ions stay within the magnetically confined plasma) so that sustained fusion is observed. JET has seen some fusion occurring, in plasmas lasting for 10-20 seconds at very high plasma temperatures. The next step device, ITER, which is 2-3 times bigger than JET, will see much more fusion power and there is confidence from what has been learned on JET that ITER and future powerplants will work effectively. It would be very hard to produce efficient fusion reactions from the head on collision of two beams as you suggest. It would take a large amount of energy to produce beams which were fast and focussed enough – nuclei are really small! Hardly any beam particles would have head-on collisions and fuse, and the majority of particles would just get deflected and decelerated. The advantage of a hot confined gas is that particles collide at high speed from all directions, not just the direction of the beam. What is the temperature required for a Fission (not Fusion) reaction of Deuterium and Tritium? FIssion is splitting the nucleus – an effective energy source for very large elements, such as uranium, especially if they have unstable nuclei. Deuterium and tritium (which are very light nuclei) would be almost impossible to split. No energy would be released, instead you would have to inject energy. This would form hydrogen and neutrons but would require temperatures far in excess of anything we could even come close to on earth. As it is, fusion of these two isotopes, which actually releases energy, requires temperatures in the region of 100 million degrees Celsius to get it started. These are the temperatures inside JET. What are the plasma heating methods? In magnetically confined plasmas that we study in JET, there are three main ways of heating the plasma. The first is to use the strong electric current that is generated in the plasma (to help its stability and control) – this is known as Ohmic heating and heats the plasma in the same way that a current in a wire heats the wire. This current is very large (3 – 4 mega amps on JET) and can heat the plasma to over ten million degrees Celsius. However, to access the temperatures required for fusion – over 100 million degrees – other methods are required. Powerful microwaves, injected in different frequency ranges (megahertz to gigahertz) can heat the plasma by giving their energy to the electrons or ions in the plasma. The most powerful method is neutral beam injection – these are beams of highly accelerated neutral atoms which are injected into the plasma and give up their energy as they undergo collisions with the plasma ions. Fusion releases energy when the nuclei of two forms of hydrogen (in our case, we use deuterium and tritium) are collided together at such high velocities that they stick together or fuse. Shortly after this, they break apart, forming a neutron and a helium nucleus. In this conversion a small amount of mass is converted to large amount of energy, thanks to E=mc2, so the neutron and the helium nucleus produced by the reaction have a lot of energy. In a fusion powerplant, the neutrons will be used to heat water and drive a steam turbine. The helium atoms, which are positively charged do not escape the magnetic field so their energy is retained in the plasma, helping to keep it hot enough for fusion to continue. Is research at JET still aimed at the ultimate goal of commercial energy production? Yes. Results from JET and other tokamaks around the world have given scientists tremendous confidence that they can control and confine the plasma sufficiently that ITER will deliver significant fusion power output. ITER will nonetheless still be an experimental facility. Plans are already afoot to begin work on the first power station, DEMO, around 2030. In the meantime work continues on JET and other machines to optimise the plasma confinement. Work on how to exhaust plasma impurities in the divertor of the tokamak and how to reliably induce so-called “transport barriers” in the plasma (and thus improve the insulation of the burning plasma core) are particularly important at the moment. The funding for JET is spread across the whole of Europe. This supports the operation and maintenance of the tokamak (undertaken by CCFE on behalf of Europe) and the undertaking of experiments by groups of scientists from EUROfusion laboratories all over Europe. If the plasma is 100 million degrees, how do you get all those pictures? There are many ports into the vessel that allow heating, cooling, fuel, vacuum or diagnostic systems access to the chamber. The pictures of the plasma are taken through ports with transparent glass, by fast framing CCD cameras (the latest ones digitally) positioned outside the vessel. It is worth noting that while the plasma core is at 100 million degrees, the edges are a lot cooler, and – when confined properly – the plasma does not touch the walls of vessel. The walls of the vessel are maintained at a constant temperature of 200 degrees Celsius to remove any moisture. What temperatures are achieved at JET and in fusion reactors? In the JET tokamak plasma is contained in a doughnut shaped vessel and is heated up by (amongst other methods) passing a current through it. Temperatures around 100 million degrees C have been achieved and fusion (albeit at a relatively low level) has been observed. An eventual fusion power plant will be hotter (200-300 million degrees C or so) and bigger than JET and will produce abundant amounts of fusion energy which will be used to generate electricity. When using neutral beams to heat up the plasma do they not pollute the plasma and cause it to disrupt and how do you accelerate these neutral atoms? Neutral beams atoms do not pollute the plasma – they will be Deuterium atoms that will actually fuel the fusion reaction and increase it by making the background fusion ions hotter and increase their density (via collisions and ionisation). The energetic neutral atoms are created by first accelerating a beam of ions (via powerful electric fields) and then neutralising it to produce a beam of energetic atoms that are able to be injected into the plasma (the beam must be neutral to find a way through the magnetic fields that contain the plasma in a tokamak). I recently heard a sort-of scientific urban myth that at some point during its operation the plasma inside the torus touched the top and the whole thing jumped up in the air. Is there any truth to this story? Normally in JET, the plasma is controlled (by powerful magnetic fields) so that it stays away from the walls of the vessel. In this way the plasma can be sustained and heated to fusion temperatures. However,if the magnetic field system is unable to control the movement of the plasma for some reason, the plasma will hit the vessel wall and rapidly extinguish (or disrupt). In this process, the plasma energy is transferred to the vessel structure, heating the vessel, driving currents in the vessel structure and (as you pointed out) moving the vessel a few mm. This is possibly where the urban myth has originated but it is worth remembering that disruptions are pretty rare on JET and scientists are constantly trying to determine when the plasma is losing control and correct the situation before a disruption can occur. Also, the structure of JET has been designed to withstand such transient movements and is in no danger of falling off its supports!!!! What do the central solenoid, TF, PF and divertor coils do? The hot plasma created in the tokamak (such as JET) needs to be confined and controlled in order for sustained fusion to occur. The solenoid, which is positioned around the plasma, induces a powerful electric current in the plasma, thus heating the plasma up (much as a wire is heated when a current is passed through it). The TF (Toroidal Field), PF (Poloidal Field) and divertor coils all provide magnetic fields used to confine and control the geometry of the plasma. The TF coils provide the main field that traps the plasma particles within the interior of the vessel. The PF and divertor coils shape the plasma and ensure it remains stable (radially and vertically) within the vessel. How do the magnetic fields contain the plasma and how are these fields are set up and powered? As the ions in the plasma are charged (the plasma is so hot all the negatively-charged electrons are stripped off the atoms, leaving them with a positive charge) they respond to magnetic fields. By setting up magnetic field lines toroidally around the interior of the tokamak, the ions and electrons in the plasma are forced to travel tightly around these field lines, preventing them from escaping the vessel. Extra fields help shape the plasma and hold it stable within the tokamak interior. The magnetic fields are generated by coils which surround the tokamak vessel – these are made of Copper in the case of JET and a magnetic field is generated around these coils when large currents are passed through them. Careful design of the shape and orientation of the coils ensures the net magnetic field within the tokamak vessel is suitable to confine and control the plasma. How much electricity has been consumed by JET to this point? I cannot put a number on the amount of electricity consumed by JET I am afraid, although, suffice to say it is a lot!! Each JET pulse uses ~700MW of electricity (used to directly heat the plasma and also to provide the magnetic fields required to keep the plasma confined). What is the limitation preventing a longer maintaining of power, and how does the output of power compare to the amount of power invested necessary to produce the 10MW? I’ve read that 10 MW of power could be sustained for only .5 seconds. What is the limitation preventing a longer maintaining of power, and how does the output of power compare to the amount of power invested necessary to produce the 10MW? In fusion power demonstrations there are usually two different goals. One is to produce a steady, sustainable level of power, the other is to reach as high a power as possible, even if this is only possible for a short time. In the 1997 JET experiments, for instance, a steady fusion power of about 5MW was produced, lasting for around 5s, after which time the plasma heating was turned off and the plasma allowed to cool. In that case the reduction in plasma temperature is a deliberate result of reducing the heating power. On the other hand, techniques have been developed to improve the insulation properties of the plasma, for a short time, allowing higher fusion power to be produced, but only for that short time. Typically this results in fusion powers in the 15-20MW range produced for a time of around 1 second. Usually the end of such a high performance phase is due to a reduced level of confinement and a fall in temperature. In this case the reduction in plasma temperature is not a deliberate effect, but an illustration that the very high temperatures achieved in these plasmas are not sustainable in steady state. In both types of fusion power demonstration, heating powers of around 20MW are used. In the steady state plasmas, the fusion power is around 20% of the input power. In the high performance plasmas the fusion power is approximately the same as the applied heating power. How long is the longest sustained fusion reaction achieved by JET and elsewhere? Most of the experiments that are carried out in fusion research use only deuterium, rather than a combination of deuterium and tritium (D-T). This is because tritium, as a radioactive gas, is more expensive and has significantly more complicated handling requirements than deuterium. Deuterium-only plasma is sufficient for most of our experiments as it is very similar to D-T plasma. Only two facilities in the world have been set up to use tritium: JET, and TFTR, at Princeton University in the US, which has since been closed down. The next step tokamak (ITER), which is currently build in Cadarache in Southern France, will demonstrate much more powerful fusion reactions for 5-10 minutes and will, hopefully, provide the stepping stone to commercial fusion powerplants. What is plasma current and what is a JET pulse? Plasma current is the flow of charged particles around the tokamak’s donut-shaped vessel (as opposed to the random movement of the hot plasma particles). It is induced in the same way that a transformer works. The primary coil is a large electromagnetic coil in the centre of the donut (its pole), and when a changing current flows through this coil, the plasma itself acts as a secondary winding and has a large current induced in it. Plasma current is crucial to the operation of the tokamak in two ways. Firstly the induced current actually starts the plasma off and gives it its initial heat, in an effect known as ohmic heating. Secondly the current creates a poloidal magnetic field, which combines with the toroidal field (created by the coils around the tokamak vessel) to create a magnetic field with a twist. This twist is vital for confining the hot plasma rushing around the tokamak, because without it the particles would drift outwards and collide with the outer walls of the vessel. A pulse is the name given to the time that we have plasma in the vessel. Once the plasma is created by the coils’ large electromagnetic fields, it must be constantly heated, to replace energy that escapes (the confinement of the plasma is far from perfect). But as pointed out above, the plasma current requires a changing magnetic field, in other words the experiment can only run while until the coils reach maximum current. The pulse only last a few tens of seconds. In this time a large amount of energy is required to maintain it. We then study it and conduct experiments to try and improve its performance. Where is the JET Tokamak located? The JET machine is at the Culham Science Centre near Abingdon, about 9 miles south from Oxford in the UK. How can fusion reactions reach their break even points and release energy? In fusion, energy is released when deuterium and tritium nuclei fuse together to make a helium nucleus and a neutron. This energy release is all to do with something called binding energy – the fundamental energy which binds any nucleus together. Essentially the deuterium and tritium nuclei require more binding energy to stay together than the helium nucleus does and so after the new helium has been created the excess energy is released. This ensures energy is conserved. This energy release can also be explained by Einstein’s famous equation E = MC2, which describes an equivalence between energy E and mass M. In this case, because the products of the reaction (helium nucleus and neutron) have less energy than the ingredients (deuterium and tritium) they weigh less. Effectively in the fusion reaction a little bit of mass gets converted to energy; the conversion factor is the square of the speed of light (C2), which is a really big number. A tiny bit of mass gets converted to lots of energy. Whilst being a revolutionary technology, will fusion be too late and too expensive when more ‘environmentally friendly’ solutions are already in place? The projected time for a fully operational reactor is 30-50 years; by this point renewables (solar PV, wind etc) and hydrogen fuel (with its use in fuel cells) are predicted to be completely commercially viable and have large market shares. How do you see fusion’s ability to compete with these inherently ‘clean’ technologies when at that point in time they will be cost-effective and a large part of the power infrastructure? Whilst being a revolutionary technology, will fusion be too late and too expensive when more ‘environmentally friendly’ solutions are already in place? It is true that fusion power plants are 30-40 years in the future and, by that time, renewable energy sources will probably have a greater share of the energy market. It is difficult to say, however, whether they will be providing the majority of the electrical power in most countries. We, in fusion research, would hope to see fusion power contributing to the energy needs of the world as part of a well balanced strategy – where there is not the large reliance on only one source of fuel as there is at present with fossil fuels. We certainly never see ourselves in competition with renewable forms of energy – on the contrary, fusion power, with its key environmental advantages (no greenhouse gas emissions and short lived (50-100 year) radioactive waste burden from the activated powerplant structure) could be seen as closer to renewables than other forms of energy. Obviously we cannot see into the future but we believe a balanced and varied approach to energy using environmentally acceptable and efficient schemes will be to everyone’s benefit. Is there any possible way that we can prove the feasibility of fusion by not building this large ITER reactor? The feasibility, in terms of the way the plasma behaves, is pretty well understood (from experiments on JET and other tokamaks) and scientists are confident that larger, hotter plasmas (such as ITER) will not only produce much more fusion power, but will remain stable for long periods of time. There are other methods of fusion being researched around the world: for example the Wendelstein W7-X stellarator in Germany, the RFX reverse field pinch machine in Italy, or a number of institutions are attempting laser-induced fusion. Each of these has their own advantages and drawbacks, however magnetic confinement in a tokamak is the oldest and most mature technology, so we believe the best way forward is by building the ITER fusion experiment. As well as its power output, ITER will test the materials and technologies required in a powerplant. This step is definitely required to answer the remaining questions and prove to the world that magnetically confined fusion plasmas will work. Where is ITER being built? ITER is being built in Cadarache in southern France. Cadarache is one of the major sites of the France’s Commissariat a l’Energie Atomique, and includes the French tokamak, Tore Supra. What is ITER and how is it supposed to work? ITER is a fusion experiment like JET – a tokamak – and is being built in Cadarache, the south of France. ITER Members China, the European Union, India, Japan, Korea, Russia and the United States share of the cost of project construction, operation and decommissioning, and also share in the experimental results and any intellectual property generated by the project. Twenty years of collaborative research experiments are planned on the machine. It’s radius will be more than 2 times that of JET. And, the date for the first fusion plasma for ITER is set for December 2025. On 6 December 2017, ITER announced that “50 percent of the total construction work scope through First Plasma is now complete.” Because ITER is the largest fusion experiment ever being built on earth, reaching the halfway mark is a significant achievement. The research on tokamaks, and JET especially, has given fusion researchers the confidence that fusion power significantly greater than the input power can be generated by a device of this size. As a stepping stone to fusion power plants, ITER will demonstrate the scientific and technical feasibility of fusion power. Is there a connection between nuclear fusion research and atomic bombs? Firstly, we do not endorse the research, development or production of nuclear weapons in any form. The reaction that we seek to make use of for fusion is between the nuclei of atoms, and its large energy release can be used for weapons, however, that is where the connection ends, for a number of reasons. Firstly most of the research that is carried out in fusion does not even use the real fusion fuel, a deuterium and tritium mix, instead it uses just deuterium. In fact JET is the only operational facility in the world capable of using tritium, but 99 % of its experiments are deuterium only. This renders the experiments very low in output power, but is perfect for studying the control of extremely high-temperature plasma, the key to successful fusion power plants, without the complications of using radioactive tritium. Secondly the fusion reaction is not a chain reaction like fission. It is a very finely balanced process which can quickly become unstable – leading not to an explosion, but to a fizzle, where the plasma escapes its confinement and its energy dissipates. The A-bomb or fission bomb is based on exceeding the ‘critical mass’ of a highly fissile material, for example the uranium-235 isotope is a very different process to fusion. Yet fusion has been used in the H-bomb; how was a weapon made from such a fickle process? The answer is by combining it with fission. In fact the energy to initiate the fusion reaction comes from uranium. This in turn is used to detonate more uranium, which supplies most of the weapon’s power. Thus you can see that a fusion research facility, which uses tiny amounts of radioactive tritium fuel – if indeed at all – is very different from a atomic weapon factory, which requires considerable supplies of uranium. However, because we do very occasionally handle small amounts of radioactive material, we are technically a nuclear site, and therefore under the close control of the IAEA (International Atomic Energy Agency). Is fusion less or more expensive than fission? Studies have concluded that the cost of producing fusion power will be roughly the same as clean coal or fission, as the overall process is similar – a reaction heats water which turns a turbine to generate electricity. Fusion does differ slightly from fission in that the reaction requires more input power, to keep the reaction alight and stable. However, the energy yield is greater too, which is why the two processes have similar costs. Does fusion give off radiation? The fusion reaction releases neutrons, the energy of which will be used in future power stations to heat water to heat drive the power plant. The neutrons would be quite dangerous to humans, but when the plant is turned off the production of neutrons ceases within milliseconds. The neutron bombardment also affects the vessel itself, and so once the plant is decommissioned the site will be radioactive. However the radioactive products are short lived (50-100 years) compared to the waste from a fission powerplant (which lasts for thousands of years). Also, the radioactivity in a fusion powerplant will be confined to the powerplant itself, there will not be any waste needing to be transported for disposal, storage or reprocessing. Is more power currently generated by fusion or by fission? Fusion is in the research stage, with the first power plant demonstration planned for construction around 2030. The current and immediate future fusion facilities, such as JET and ITER, are experiments, and do not have the infrastructure for generating power. Design and planning indicates that fusion power plants will be equivalent to current coal or fission power plants in terms of size, cost and power output. What are some of the safety measures taken at a fusion experiment? Unlike nuclear fission, the nuclear fusion reaction in a tokamak is an inherently safe reaction. The reasons that have made fusion so difficult to achieve to date are the same ones that make it safe: it is a finely balanced reaction which is very sensitive to the conditions – the reaction will die if the plasma is too cold or too hot, or if there is too much fuel or not enough, or too many contaminants, or if the magnetic fields are not set up just right to control the turbulence of the hot plasma. Aside from accidents during operation, the main risk is of a leak of tritium, which is radioactive. However the amounts of tritium used in the experiment are very small – fractions of a gram at any time – and there are extremely careful procedures around the handling and containment of the fuel. In fact, nearly all of the fusion experiments currently carried out in the world do not use tritium – JET is the only facility equipped for trtium handling. For experimental purposes deuterium alone is perfectly adequate for the study of plasma in tokamaks. Since plasma is a super heated substance, will it cause the burning of the reactor and, if so, how far will the burning reach if the magnetic confinement or one of the control or safety systems fails? The answer is one of the key advantages of fusion as a potential energy source over nuclear fission power stations – its inherent safety. Although the plasma in a tokamak is extremely hot, it is at low pressure, and so its total heat energy is not large – there is only a gram or so of fuel present. Plasma is kept away from the vessel containing it by the use of magnetic fields. The magnetically confined fusion plasma (that we are researching at JET in Culham) can only operate under strict conditions. If any of the systems fail (such as the confining toroidal magnetic field) or if, by accident, too much fuel is put into the plasma, the plasma will naturally terminate (what we call “disrupt”) – losing its energy very quickly and extinguishing before any sustained damage is done to the structure. There is no concept of ‘meltdown’ in a fusion reactor. Is EUROfusion conducting the only serious research into fusion power? I read somewhere that the USA’s program was shutdown during the Reagan administration. Has the USA (other than its physicists) lost interest in fusion power? Europe has for a long time been the leader in fusion research. EUROfusion laboratories all across Europe are very active in magnetic confinement fusion research both in their domestic programmes and via the EUROfusion collaboration. The EU has been investing almost twice as much into fusion research as Japan or the US. However, there are many other countries involved in fusion research. The international fusion experiment ITER represents over three-quarters of the world’s population, through its signatory countries, EU, USA, Japan, Russia, India, China and South Korea. It is true that fusion research in the US was downgraded somewhat in the 1990s, after a major budget cut, resulting in the US pulling temporarily out of ITER. Nonetheless today magnetic fusion research in the USA is still vibrant, with major experiments operating in San Diego, Boston and Princeton. They also have a major program researching laser-based inertial confinement fusion. Why aren’t governments funding this research a lot more? Why aren’t governments funding this research a lot more? Nearly free limitless power coupled with little environmental impact would be a great boon to our world. Clearly the science is sound – we can look up into the sky and see that it works, that large glowing orb is powered by the same method. Could it be that governments are afraid that the loss of dependence upon fossil fuels could hurt the global economy as they collect huge sums of money from taxing oil companies and end users (we the people) of fossil fuels? This is difficult to answer. The conversion to a power generation infrastructure based on fusion would require a large investment, which is perhaps why governments are waiting for more solid proof that fusion will work. We believe this will come from ITER (the successor to JET, currently built in Cadarache in the South of France) which will generate ten times more power out than that used to heat the plasma. However moves toward a global economic model with a price on carbon will make fusion more attractive. Energy is big business and there will be large amounts of money to be made in the future. Perhaps it will be innovative companies that will lead the way, and not governments, which by their nature are quite risk-averse. Why, if we have fission, do we need fusion? Who will use fusion power? What precautions will be taken to ensure that one group of people can’t control global fusion energy? All developments in fusion technology are published in scientific journals, and therefore are in the public domain. Thus it should be commercially available to any country as an alternative to conventional forms of energy production. Indeed ITER, the next generation of fusion experiment is funded by seven countries (EU, USA, Russia, China, Japan, India and South Korea) which collectively represent three-quarters of the world’s population. The fuels for fusion, deuterium and lithium (which can be used to develop tritium) are also widely available – they can be extracted from sea-water – so there should be little possibility of monopoly there. However it should be realised that the fusion tokamak is one of the most complex things ever built by humans, so it is unlikely to be within the scope of a small pacific island nation for example. But aren’t there any real downsides to fusion power? It can’t be all great, can it? There are downsides to fusion power but we believe the potential advantages (almost limitless fuel supply, no greenhouse gas emission, no dangerous waste products or possibility of explosion) heavily outweigh them. The main downside is that it is difficult to achieve – hence we are still researching the concept rather than actually generating electricity through fusion! Keeping the plasma confined (by powerful magnetic fields) and heated to high temperatures is rather tricky, although recent results from JET and other fusion experiments around the world have suggested the whole idea is feasible. Also, fusion is a nuclear process and the structure of a commercial fusion power station will be radioactive when it has finished producing electricity. However, by selecting the right materials, the structure should become safe to handle in a relatively modest timescale (50-100 years) – comparing favourably to the much longer lived radioactive waste (many thousands of years) generated by fission power plants. Would it be best to devote a majority of resources to the Tokamak projects instead of Z pinch machines or laser type fast igniter approaches? Would it be best to devote a majority of resources to the Tokamak projects instead of Z pinch machines or laser type fast igniter approaches? Besides the technical spin-offs that the other approaches contribute, is the Tokamak more efficient design toward power plant production? The tokamak is probably the most advanced fusion technology at the moment, however it has also probably had the most investment in it. All fusion approaches have their advantages and drawbacks, so it would be unwise to put all our eggs in one basket. Other possible fusion methods, inertial confinement, stellarators, or Z pinch machines may succeed as well as tokamaks, or at the very least, lessons learnt in developing these technologies may be applicable in tokamaks. Shouldn’t we be looking at smaller tokamaks? I would think that ITER would require a substantial amount more power to produce the plasma than JET. If you were to create a smaller reactor you would need less energy to run it, thus allowing for it to run longer which should allow you to study it better. If you make it smaller you can exert more magnetic force to contain and heat the plasma and possibly make it self sustaining. Shouldn’t we be looking at smaller tokamaks? It is true that ITER will require more power to heat the plasma than JET as the plasma is bigger and will need to be hotter. However, the confinement is key: ITER, as it is hotter and bigger, will lose proportionately less energy than JET and so will produce a much more efficient fusion reaction than JET. In addition, electricity is needed to run the magnetic field coils in a tokamak and this is a large amount on JET. On ITER, the electricity requirements of these coils is small as they will be superconducting and will require little voltage to keep them running. The duration of the plasma in ITER will be much longer than JET (5-10 minutes compared to 10s or so in JET) – the restriction on the plasma duration comes from the discharging transformer required to induce the plasma current in a tokamak – this will be much larger on ITER than JET – also, hotter plasmas require less induced voltage to keep them running. Creating smaller reactors would be very good, but the confinement of plasma particles gets worse as the plasma gets smaller (and good confinement is required for effective fusion). So, the chances of having a fusion powerplant under the bonnet of your car are remote! How does plasma heat if all the particles are travelling in the same direction? The basic heating system in a fusion reactor is electromagnetic: Huge coils are electrified, which create a magnetic field that drives the plasma around the donut-shaped tokamak, known as the plasma current. However this plasma current is not every charged particle marching in step. The plasma is at an extremely high temperature, which means the particles are moving very fast in a random directions; when the magnetic heating current is turned on there is an overall drift of particles in the direction of the current, although some individual particles will be moving faster and some slower than the average. Also the positive ions will be sent in the opposite direction to the electrons, which are negative. The precise effect of the magnetic field is to constrain the charged particles to the magnetic field lines. For a particle initially travelling parallel to a field line, it will just follow the line. But for a particle travelling at right-angles to a field line it will start to rotate around the line. Particles at any other angle will begin to spiral along the field line, describing tight spirals if they were initially close to 90 degrees, or more stretched out spirals for particles more parallel to the field lines. Of course for those particles initially at greater than 90 degree angle (i.e. going backwards) they will spiral along the field lines in the backwards direction. Thus although there is magnetic confinement, the particles are not all travelling in the same direction. In addition to the basic heating system on JET there are also systems based on electromagnetic radiation (microwaves) and also the injection of high-speed particles, all of which rely on a few fast moving particles which collide with the other randomly-moving plasma particles and share their energy. Would a Tokamak work better in zero/low gravity conditions? Gravity has very little effect on the dynamics and/or stability of the plasma so operation of a tokamak in zero gravity would make little difference. The particles are moving at such high speeds, because of their heat, that they experience much stronger magnetic forces than gravitational. How much more energy will it take a Tokamak over the “breakeven point” to actually produce power due to loss of energy in the processes of electricity production? Breakeven is achieved when the energy from fusion reactions is larger than the energy required to sustain the plasma. So far JET has reached about 60 percent of this level, but in ITER we expect to exceed breakeven by a factor of ten. In the process of converting the energy created into usable electricity for the grid a percentage of the power is lost. Predictions based on current coal and fission power plants suggest about two thirds of the power is lost. This means that the power plant would need to create about three times as much power as it consumes to break even (termed a “Q” of 3). Future power plants will probably operate at about a Q of 30, in other words producing 30 times the power they consume. After losses in conversion this will amount to electricity production of about 500 GW, 10 times the plant’s consumption. What are the minor and major radii of the plasma? The major radius of a tokamak plasma is the radius of the ring of the tokamak, measured from the centre of the “donut hole” down the centre of the device to the centre of the plasma. The minor radius is the radius of the cross section of the chamber – i.e. of the plasma itself. Are there any other tokamaks in operation around the world? There are many tokamaks in operation around the world, all contributing to international efforts to realise commercial fusion power. As well as JET, the other tokamaks in Europe, which are part of the EUROfusion agreement include ASDEX -Upgrade, MAST-Upgrade, TCV, and WEST. Nick Balshaw, researcher at JET, has put together a website with information about all the tokamaks in the world. Have a look: All- the- World’s Tokamaks. And Joanne Flanagan, also a JET researcher, has created a map that shows the location of the tokamaks. There are many tokamaks in operation around the world, all contributing to international efforts to realise commercial fusion power. As well as JET, the other tokamaks in Europe, which are part of the EUROfusion agreement include ASDEX -Upgrade, MAST-Upgrade, TCV, and WEST. There are also tokamaks operating in the USA and Japan, and smaller tokamak experiments all over the world (in countries such as Brazil, India, Australia, China, Russia etc.) Nick Balshaw, researcher at JET, has put together a website with information about all the tokamaks in the world. Have a look: All- the- World’s Tokamaks. And Joanne Flanagan, also a JET researcher, has created a map that shows the location of the tokamaks. How is it that both fission and fusion produce power? If splitting a large atom into two smaller atoms releases energy, it seems that combining two smaller atoms into one larger atom would require energy, not release it. Yes, at first sight it doesn’t make much sense. The key is in how tightly the protons and neutrons are held together. If a nuclear reaction produces nuclei that are more tightly bound than the originals then energy will be produced, if not you will need to put energy in to make the reaction happen. It turns out that the most tightly bound atomic nuclei are around the size of iron (with 26 protons in the nucleus). That is, one can release energy either by splitting very large nuclei (like uranium with 92 protons) to get smaller products, or fusing very light nuclei (like hydrogen with just one proton) to get bigger products. In both cases the reaction shifts the size of the atoms involved towards iron, that is towards lower energies in the “valley” pictured below. The energy gain is released in the form of kinetic energy of products (which usually converts to heat – random motion in the medium). Has there been any conclusion/theories why the power generated by this process is less than the power required to create the nuclear reaction? We definitely achieve fusion reactions here at JET, it’s just that so far we have needed more power to get it going than we have created. The power generated in JET (best so far = 16 megawatts) is limited to a level much lower than it could be by the parameters of the plasma (the hot fuel gases – deuterium and tritium). Three conditions need to be maximised to get fusion to really work and start to generate reasonable power from fusion: density, temperature and time length. The density of the plasma (i.e. number of nuclei per unit volume) and the temperature of the plasma (or speed of the nuclei) have been pushed pretty much as far as they can in JET plasmas, but the third parameter is the key one. This is the so-called confinement time – and is a measure of how quickly energy leaks out of the plasma. Even though we use powerful magnetic fields to hold the plasma in place, energy is radiated out of the plasma – and this is measured by this parameter. By increasing the size of the tokamak – and hence its ability to hold energy inside itself – this parameter will be increased and the power generated will rise. Hence, the next international device – ITER, which will be ten times the volume of JET – will generate ten times more fusion power than the power injected to sustain the fusion process. In the future bigger powerplants will produce several gigawatts. Is there a point in the circulation of deuterium and tritium where the stream is shock pinched such as in a magnetic venturi? The plasma is certainly magnetically squeezed somewhat inside JET. However the magnetic field, and therefore the plasma, is more or less symmetric around the torus, there are no pinch points. If the flow of nuclei becomes really constricted, the plasma stability can start to become adversely affected. What is the most specific figure that makes the machine in your institution different from the rest of the tokamaks? The most obvious thing is that it is the biggest fusion tokamak in the world that is currently operational. It is also the only one which can actually observe thermal fusion reactions, as it is the only existing device able to run with tritium – all others are deuterium only. What is the budget per year for the JET research programme? It is of the order £60 million per year. This is contributed in various amounts by the European Commission, and through EURATOM each of the fusion programmes in EU member countries including Switzerland as an associated member to EUROfusion. I am thinking of doing an extended research project on Fusion, including confinement techniques like magnetic and inertial. Could you point me in the direction of some books (or other) for further, detailed reading? There is some information on our websites: EUROfusion and JET) and CCFE. Also ITER has an extensive website. In terms of more detailed books, there is a book all about tokamaks – Tokamaks by John Wesson. This goes into real detail about the physics of how tokamak plasmas behave. How much power is needed to start the reactor and to keep it working? JET consumes large amounts of power – for fusion to occur we need to create and maintain plasma at extremely high temperatures. Additionally we need to contain the plasma by energising large magnetic coils. In total, when JET runs, it consumes 700 – 800 MW of electrical power (the equivalent of 1-2% of the UK’s total electricity usage!). Future reactors will use superconducting magnetic coils, which are much more efficient, so they will not expect to use so much power – maybe 200-300 MW of electrical power. They will produce 1-2GW (1000 – 2000 MW) of electricity, whereas JET does not have the set up to harvest any energy produced, as it is not a power reactor, but an experiment. The power required to keep a reactor working is an interesting question. Energy input is required to keep the plasma hot, because most of the energy produced by fusion is carried away by the neutrons. However 20% is carried by the helium nuclei, which remain within the plasma, so it is possible to reach a point called ignition, at which the production of hot helium is enough to sustain the plasma and the external energy sources can be turned off. It is not clear yet however whether that will be the optimum operating regime in a power plant – being slightly below ignition may give better control of the reactor (while still producing plenty of hot neutrons). You state that a fusion reactor would generate about 1500 Megawatts but what is the time span in which that amount is produced? A fusion powerplant will indeed produce about 1500 megawatts of power (similar to an average conventional fossil fuel power station) and will produce this amount of power all the time it is operational. Watts are a measure of energy per second – in other words, this powerplant will produce 1500 million joules of energy each second it is operational. How much electricity could be produced in the best scenario? We have scientists and engineers here working on possible future fusion reactor designs and the largest capacity considered so far is about 3 gigawatts (this compares to typical current coal-fired stations at 1 – 2 gigawatts). In theory, the larger the reactor, the more efficiently it would operate, and the more electricity it would produce; so it might be possible to go larger in the future. Even if you could sustain fusion for prolonged periods, how do you extract power from the reactor? A nuclear fusion power plant would be no different from a conventional power plant in the sense that there would be a heat exchanger connected to a steam generator to turbines. The heat would be extracted from the lithium “blanket” inside the reactor wall which would absorb the neutrons created by the fusion reaction between deuterium and tritium. How large might fusion reactors become once the technology has been proven? It is true to say that the bigger the plasma, the better the confinement and the bigger the fusion gain factor. However, increasing the plasma temperature and density also achieve an increase in gain factor. It is envisaged that future fusion powerplants would occupy buildings no bigger than presently house fission or coal fired power stations. If the lithium blanket reacts to form deuterium and tritium will it eventually get used up and need replacement and might the lithium melt? There would be enough lithium in a typical blanket to last the lifetime of a powerplant (the blanket is large, completely surrounding the plasma). However, a blanket would have to be replaced in a powerplant about every 5-10 years as they will be gradually damaged from the intense neutron bombardment they will undergo. Many different blanket designs have been modelled, but have not been physically tested yet. They vary in composition – some have pebbles of lithium alloys, others have a lithium alloy liquid flowing through them. Many things need to be considered in the blanket design – robustness, how radioactive it will become from constant neutron bombardment (this depends on the exact materials used), how easily the heat can be extracted via a suitable transfer fluid and heat exchanger, and once the tritium has been formed, how we extract it etc. The blanket designs need to consider all these issues and more – and will be tested for real with a blanket module on ITER. What is a lithium blanket and how does it work? What happens to the neutrons after they’re absorbed by the lithium blanket? The blanket is a layer surrounding the vessel in a fusion powerplant. It will absorb the energy from the fusion neutrons produced in the plasma, boiling water via a heat exchanger, which will be used to drive a steam turbine and produce electricity. The proposal is to embed lithium in the blanket, because that will react with the neutron to produce tritium, which is a fuel for the plasma, along with deuterium. The breeding of tritium occurs through the reaction Li6 + neutron becomes He4 + tritium. This would be advantageous because tritium is radioactive, with a short half-life, and so is difficult and expensive to obtain – it would be far more sensible to manufacture it onsite as a by-product of the fusion process. The next step from JET (and the other tokamak research being undertaken around the world) is a device called ITER, an international tokamak project, 2-3 times bigger than JET, costing several billion pounds and capable of producing significantly more fusion power for longer periods. This will demonstrate the feasibility of the plasma physics and fusion engineering of a potential power plant. An eventual commercial power plant will probably be 30-40 years away. However, if the present international funding for fusion were increased, fusion power could be a reality more quickly. When are we going to use fusion as a source of energy? I remember 50 years ago they were talking about it, and so far I have not seen any of the present nuclear reactors replaced by fusion reactors. What is the problem? The problem was the unrealistic expectations regarding our abilities to control the extreme temperatures in which fusion can burn (hundreds of millions of degrees Celsius). As it turns out it was easier to create the high temperatures than it was to control the plasma we had created. However we have now developed sophisticated magnetic field control and feedback mechanisms which allow us to control the plasma, at the temperatures required for fusion. Up to now there has been a steady progress towards the target parameters of heat, density and confinement time. In 1997 JET demonstrated a significant release of fusion power, 16 megawatts, which was about 65% of the external heating input. Today, by extrapolating the “evolution not revolution” fusion experience, we are confident that the next step device, ITER, will actually produce controlled releases of fusion energy. As a consequence, a lot of consideration is now devoted to the technological challenges of fusion, such as the selection of materials that will face the heat of burning plasmas. These details have been hardly ever considered before. ITER has finally received large political support on a global scale, and will be built within ten years. After a few years of tuning experiments, we expect to see the first burning plasmas by 2025. However, these projects are such large undertakings that even if everything works perfectly, it will take some years simply to build the technology. Allowing time for fine tuning about 20 more years will be needed to transfer the technology from research to industry. Why are superconducting coils used in fusion devices? Superconducting magnets are able to carry higher current and produce stronger magnetic field than conventional counterparts. They also consume less power and are cheaper to operate. The magnetic field coils planned for use on ITER and future fusion powerplants will use superconducting materials, such as alloys of niobium and tin, or niobium and titanium, which become superconductors below -264 degrees Celsius. In ITER, the vessel and its coils will be surrounded (in fact immersed) in a suitable coolant, such as liquid helium (at -269 degrees Celsius) to maintain the coils at low enough temperatures. Superconducting magnets are already used widely, for example in MRI machines, and they are also used at CERN, so the technology does exist for these types of coils. Since ITER is expected to produce in the plasma ten times more power than the power put into the plasma, does this not mean that the substance produced and re-used will by further extrapolation reduce the power needed by a reduction of 10? And this reduction lead to a further reduction of 10 and so on until almost no power is used? ITER will generate fusion power that is ten times more than the power used to directly heat the plasma. Additional power is required for the magnetic field coils, although this will be much reduced at ITER as they will be superconducting. Nonetheless, as you suggest, in the fusion process there will be more power produced than is consumed – as indeed there is in any power plant. The energy produced by the fusion reaction is mostly carried by the neutrons, which, because they are neutral in charge, are not affected by the magnetic field that confines the plasma. Instead they stream out of the plasma into the walls of the vessel where their energy can be collected and used to heat water, as in a conventional power plant. The other product, the helium nucleus, carries only 20% of the energy, but because it is charged, it stays within the plasma. So you are correct, this energetic “substance” contributes to the heating of the plasma, and replaces the need for extermal heating. At a certain point the heating caused by the helium production will be enough to turn off the external heating systems completely – this point is known as ignition – and as you point out, no further input power would be required at that stage. If a superconductor were discovered that could operate at room temperature, without having to be cooled cryogenically, what would the potential economic savings be in the production and maintenance of tokamaks? Of course the details would depend on the properties of the superconductor. If it had just the same properties as Niobium Tin, then you might save around 100 million dollars in plant costs (this is just a round number of course) and about 10 million a year on running costs, which would no longer be needed to cool the magnets cryogenically. What might be more important would be the simplification of the magnets themselves. Operating at room temperature would mean the coils would need less stabilising material, to prevent quench in the event of slight warming, and they may possibly also be able to handle higher stresses with less supporting material. If this were true, the magnets could be reduced in cost by a billion dollars or more! Just a cautionary note, it is not just that the materials must superconduct at room temperature. The problem of making a magnet is that they must remain superconducting when carrying high current as well as being exposed to a high magnetic field. Many superconductors are very poor at this. However, when we are ready to build fusion power stations, the developments in superconductors might have been so large that things are much easier than we currently think! With the work that has been done since 1997, what do you estimate would be the Q value if you did use full power? Firstly we do use full power, in terms of input power. We have recently upgraded our beam power, and injected a record 26 MW late last 2012. This should be pushed at least another 4 MW during 2013 after maintenance shutdown. What we do not do often is to use tritium, which produces the full power output, we mostly do experiments with pure deuterium. This is because tritium, being radioactive, is complicated to handle. Also it decays so quickly ( ~100 years) that there is barely any to be found naturally, so it is extremely expensive. It is manufactured from lithium, by bombardment with neutrons, a process which would in the future be integrated into a fusion plant. Another drawback of tritium experiments is that the high power output is in the form of high energy neutrons (more and at higher energy than there are for fusion in pure deuterium). Of course in a future plant there would be a blanket designed to capture these and use their energy for generating electricity, but JET does not have such a blanket as it is an experiment that runs only in short pulses. These neutrons are able to affect the materials in the vessel, causing some to become radioactive. There is a lot of research into materials for future vessels that will minimise this effect, but the 1983 materials of JET are not super-good in this regard, so we try to minimise their exposure. Using deuterium alone gives us a lot of information about how plasma behaves and reacts to heating and impurities and so on, without the inconvenience of having to use tritium. That said, we are planning an experimental campaign some time in two to three years, to observe the differences from deuterium only. We will also move to a heavier species again, helium, to really explore the difference that mass makes. So in a couple of years we may again be able to see what Q we can attain, although surprisingly enough, we don’t expect a huge improvement. We got close to the expected Q limit out of a tokamak the size of JET – this scales to the Q of 10 expected for the larger-sized ITER. What is going to be really important will be the stability of the plasma. JET’s 1997 world record was short lived, but we believe we can now hold that plasma steady for as long as we can power the tokamak – up to ten seconds of peak power input. In other words the focus will be on fusion _energy_ produced. How far does alpha radiation travel and what material will absorb it? The range of alpha’s in air depends upon their energy but in any case the vast majority are stopped by very thin layers of materials such as paper or even people’s skin! The question on precautions for handling sources is far too general to be answered simply. Generally the principles of time, distance and shielding should be applied. What was the cost of construction of JET? 198.8 M European Units of Account (EUA – predecessor to the Euro). JET was completed on time and on budget in 1983. What is the Q-value for JET? Most of the time we do not use the full-power fuel, deuterium/tritium mixture, however in our high power experiments in 1997 with this mixture the maximum output was 16.1 MW, from about 24 MW input power, giving a Q value of about 0.65. How much energy from the 14.1 MeV neutrons is used to split the lithium? Doesn’t this energy requirement diminish the reactor’s actual gross power output? The Li-7 transmutation reaction does have a threshold energy, that the neutron needs to have for the reaction to occur, but the Li-6 reaction can occur at any neutron energy. However in both reactions energy is released, the exact amount depending on the nature (energy, velocity, etc) of the incident neutron. This is because the products are more stable then the initial components and hence require less energy to bind them together. The released energy enters the blanket and hence into any power generation system. Therefore the efficiency of the system is not reduced by any meaningful amount due to the tritium breeding in the blanket. What isotopes of lithium are best to use in the blanket for generating tritium? There are transmutation reactions from both Li-6 and Li-7 to tritium however the Li-6 reaction is the dominant pathway. Where does the plasma colour come from? The colour comes from the fuel, which is basically hydrogen. Hydrogen gives out two different colours, a strong red and aqua-blue, which combine to give the pink colour that shows up in most pictures. The two colours come from specific transitions of the hydrogen atom’s electron between different energy levels (for more info look up the Balmer series). It’s interesting to note that in the centre of the plasma it is so hot that the electrons are able to escape from their atoms, and so there is less light emitted as no transitions can occur. Around the edges where the plasma is cooler the electrons are able to reunite with their nuclei thereby emitting light. Each element has its own unique set of electron levels, and hence the light emitted when the electrons jump between levels gives a unique signature for that element, called a spectrum (the study of it is called spectroscopy). So if there are any contaminants in the plasma they can show up by changing the colour. So the colour of a pure plasma is pink, if there is too much beryllium from the walls, that adds a blue green tinge, Oxygen is blue (that’s a bad sign, means there’s a leak) etc etc. Our expert on cameras pointed out that from the brightest point to the darkest point inside the vessel is a huge dynamic range – the cameras JET is using don’t cope with this very well (cameras that do, don’t survive the harsh environment inside the vessel!). It may be that different cameras give different colours for the same plasma, or we had turned the gain up to bring out a darker part, which made it look a lighter colour. Also some of the cameras have different optical components (filters etc) in front of them to cut out particular parts of the radiation, so that may have affected the apparent colour too. When will fusion power be used in ships and how much of a reduction in size would it take? Would it be possible to produce power, using He-3 and today’s fusion reactors, that could be put into the grid? The first thing to note is that fusion reactors – producing commercial electricity – are not ready yet. We are still researching how to make this technology work in an economically and efficient way. The first true fusion power stations are probably 30 years away. All our work is focussed on making a future power station based around the Deuterium-Tritium fusion reaction. This releases energy in the form of fast neutrons – and many of the technology issues we face are around the capture of the these neutrons, extraction of their energy to heat water and drive a steam turbine to generate electricity. We are, of course, aware that there are other possible fusion reactions – and some of these involve He3 – but the best prospects seem to be with D-T reactors at present. In the future other fusion reactions may be considered (D-He3 or D-D) once we have D-T reactors sorted out. Question who was the general contractor responsible for the construction of the JET facility? There was not one general contractor for the construction of JET in the early 1980s. As a European project, the project team placed orders with many contractors all over Europe to build parts of the device (vacuum vessel, magnetic coils etc). As the current is driven by transformer action, it can only be driven in pulses. In between pulses, when there is no current and so no poloidal field, what happens to the plasma? At present, the current in the plasma, which is essential for plasma heating and providing poloidal field for confinement, is provided by the discharge of a transformer. The pulsed nature of the discharge is due to the fact that the transformer can only operate in one polarity. If it operated continuously, the AC nature of a transformer would require the plasma current to reverse – which would adversely affect plasma stability and confinement. The simple answer to your question is that the plasma is not able to exist in the periods where the transformer is recharging. Naturally, as long as we rely on the transformer to provide the plasma current, the plasma is pulsed. Looking forward to a power station, it is feasible to envisage a station where electricity production is continuous. You could have several tokamaks, each taking over from each other to provide continuous electricity production. Or you could explore other methods of providing the plasma current that do not rely on the transformer. This could be possible using mechanisms within the plasma (so-called bootstrap current) or by means of directed microwave injection. A cousin of the tokamak, the stellarator, avoids the need for plasma current by means of an complex magnetic field configuration. If these methods can be harnessed to enable continuous plasma current production then we could have continuous power output. Ninety square metres seems like a very large volume for the plasma torus. I had expected far greater constriction would be necessary to achieve the Lawson criterion plasma density. The Lawson criteria deal with the temperature, density and confinement time required to achieve energy gain from fusion. There is no limit to the volume; for example, the sun is a fusion reactor with a very large volume! In fact a larger volume is an advantage as it means a smaller fraction of the plasma’s energy is lost through its surface. Of course, having a larger volume means there needs to be more fuel to reach the required pressure. This in turn requires more heating capacity to get this greater volume to the extreme temperatures required to achieve fusion. It is interesting to note that the pressure inside JET is very low, even in the middle of the plasma pulse. It is 100 000 times lower than atmospheric pressure – in contrast with the sun, which has an extremely high pressure in its core, where fusion occurs. These two fusion reactions use very different regimes to satisfy the Lawson Criteria – surprisingly the terrestrial fusion experiments like JET, with their lower pressure, run at a much higher temperature than the sun! Strictly speaking the original criteria of Lawson have been altered somewhat since 1958; physicists today discuss the Triple Product, which is broadly the same idea, although it differs in the details. Are members of the public allowed to visit any of the fusion laboratories? Yes! Members of the public can visit fusion facilities in Europe. Most of the visits have to booked in advanced. Here are links to arrange visits to some of the fusion facilities. What temperatures have been recorded in the walls of the vessel during operation? In JET, the vessel walls are maintained at a high temperature of 325 degrees Celsius all the time. The main increase in temperature during plasma operations is noted in the lower (divertor) region where the wall tiles are in contact with the plasma. Typically, temperatures here would rise to 1000 degrees Celsius. The maximum we have observed is over 1500 degrees Celsius. What is the thickness of the lithium blanket in JET and in ITER? JET does not have a lithium blanket. It is an experimental facility, and not a power reactor, so it is focussed on exploring the behaviour of plasma, rather than producing a long stable output.It rarely runs on tritium, as deuterium only plasma is sufficient for research. When JET runs with a deuterium-tritium mixture – and achieves conditions sufficient for fusion – researchers measure the neutrons emitted from the plasma, but do not use them for generating power. ITER will test different lithium blanket modules – but these will not completely surround the vessel. They will be of the order 0.5 – 1m in thickness. Of course, a future fusion power station will have a fully surrounding blanket – similar thickness. Is the plasma chamber evacuated? To what pressure? Do the tiny amounts of deuterium and tritium alter the pressure? The plasma chamber in a tokamak like JET has to be pumped down to a very good vacuum before decent plasma can be created. Any impurities, for example, atmospheric gases such as oxygen or nitrogen, need to be removed to keep the plasma stable. A typical base pressure inside JET is in the range 10-7 to 10-8 mbar (the atmosphere around us is about 1000 mbar). The small amounts of cold deuterium and tritium gas (~0.01 g in JET) introduced before a pulse increase this to about 10-3 mbar and once the plasma is significantly heated, the pressure rises further (pressure is essentially density multiplied by temperature). Pressure is approaching atmospheric in the centre of the plasma where the plasma is at its highest temperatures (100-200 million degrees Celsius). If a tokamak had been working for several years are there issues with radiation and closing the site down? Fusion processes do involve radioactive materials. A device like ITER, or the fusion powerplants that will follow, will become radioactive through two mechanisms. One of the fuels – tritium – which is a heavy isotope of hydrogen, is radioactive. Inevitably, some tritium gets stored in the infrastructure of the tokamak, giving rise to some radioactivity. In addition, following the fusion reaction in the plasma, very fast neutrons are produced. These will be absorbed in the material surfaces surrounding the plasma – and we will extract the energy here to make electricity. But upon absorption, these neutrons will also activate the material structures. This means that at the end of a fusion power station’s life, there will be a period of decommissioning required. If materials are chosen carefully, all this radioactivity should decay in about 50 years, down to levels where all the powerplant can be dismantled. This is obviously much more attractive than fission – where high level waste is created during the reactor’s operation, and can remain active for many thousands of years. If ITER or JET were fired up and someone was standing nearby, what effects in respect of electromagnetic and other radiation are there on the person? There are reasons we do not let anyone near a device like JET or ITER when it is operating. The plasma ejects significant amounts of X-rays that would be harmful to anyone standing close to it. Also, very high voltage (10,000s of volts) circuits are used to feed the powerful magnetic coils – these high voltages would also be dangerous to personnel. Finally, when JET operates with deuterium and tritium (heavy isotopes of hydrogen – usually it is deuterium only), the fusion reaction in the plasma produces neutrons, which would be harmful to anyone inside the machine hall. JET adopts very sophisticated safety systems that require, for example, complete searches of the machine hall to check it is empty, before the device can be initiated. In addition, the machine hall walls and doors are specially lined to prevent anyone outside the walls being affected. What is JET’s ITER-Like Wall? In fusion devices such as tokamaks, the plasma-facing walls of the vessel have to be able withstand temperatures in the range of around 1000 degree Celsius. A crucial aspect of a fusion experiment is to find the right kind of materials to build the plasma-facing walls. Till 2011, EUROfusion’s tokamak JET had inner walls made of carbon fibre composites. Although carbon fibre composite walls were heat resistant, they were not ideal materials for the wall. Carbon can potentially contaminate the plasma and retain tritium, which along with deuterium, is expected to make up the future fusion fuel. In 2011, JET underwent a major refurbishment and beryllium and tungsten tiles replaced the carbon tiles by using the remote handling technology. Beryllium is a very light metal and does not absorb tritium nor does it impact the plasma like carbon would. Tungsten, which is used in the parts of vessel where the chances of plasma touching the wall are high, has a melting point of 3422 degrees Celsius and has exceptional resistance to heat erosion. The use of this beryllium-tungsten combination for plasma-facing walls can be considered one of the biggest achievements in the fusion world. It has helped overcome challenges in material science, engineering, and plasma physics, and more-importantly, it is the same configuration that is planned for use in the walls of future fusion devices such as ITER, hence the name ITER-Like Wall. Will we need any complement to fusion power? Fusion has many advantages over existing power generation methods. Firstly it has widely abundant and cheap fuels, which could supply us for millions of years. Secondly it has the ability to operate in a base load capacity, which is not easy for generation methods based on infrequent sources, such as wind or sun. However the general opinion is fusion reactors will most likely supply big cities, as they provide electricity in the Gigawatt range. Renewables on the other hand might be more suitable for smaller cities. On balance the future will most likely hold a mixture of generation methods. Assuming economically viable fusion can be achieved, could this technology be harnessed for use in spaceflight? If so, what could it mean in terms of flight speed? We are entirely focussed here at JET on developing fusion as a source of electricity here on earth – and that is certainly challenging in its own right! As for the potential of using fusion power in spaceflight, it is certainly envisaged in many science fiction books, films etc. In the sense that you can release enormous amounts of power from very little material (a few hundred kilos of hydrogen only will be needed to sustain a fusion power station here on earth for a year, providing electricity for millions of people), fusion could offer the potential for space propulsion, as the fuel needed would be minimal. Fusion experiments so far have had the most success with extremely hot plasmas. These are difficult to confine for long periods – the energy escapes easily from the plasma – although we have had success by moving to larger sized experiments, which confine the energy more effectively. However for spacecraft (or any other vehicle) a smaller, more portable power plant would be required, so it seems unlikely that it will happen in the near future. Perhaps for extremely large space craft? Have there been any experiments in using a rotating magnetic field to induce a twist to the plasma flow, i.e. inducing turbulence into the toroidal flow? The induced turbulence may make the whole system more stable. One of the hot topics in plasma physics is how increased turbulent flows can improve plasma stability. Indeed on the MAST experiment here at Culham, we have an active series of experiments studying how increased plasma flow (up to supersonic speeds) in toroidal and poloidal directions affects plasma stability and confinement. How long is the time between pulses at JET? Is this time typically longer than the limit imposed by the plasma physics? The time between pulses is normally more than 20 minutes and is usually determined by data collection and analysis and preparation for the next pulse. What is the time limit to a pulse imposed by the heating of the copper coils? The operation of a tokamak relies on the hot plasma being confined within a magnetic bottle, created by large electromagnets. At JET, the electromagnets are made of copper, and carry currents of many thousands of amperes, which generate large amounts of heat because of their resistive losses – this heat build-up limits the length of the pulse to around 30 seconds, although at lower temperatures, a lower magnetic field is required and so the pulse can be longer. After a pulse, cooling for about 20 minutes is required before the coils are ready to pulse again. Future fusion facilities, such as ITER, will have superconducting coils which will avoid these losses. How much of the toroidal coils resistive loss (during a pulse) is removed by the water cooling system, if any? Or is the cooling used only to shorten the time needed to cool the coils enough for the next pulse? All of the resistive loss is removed by the cooling system, which runs continuously. The pulse lasts about 30 seconds and the cooling time is about 20 minutes so about 2% of the loss is removed during the pulse. What is the resistive loss (power and total for each pulse) in the toroidal coil magnet coils? The total power required to run the coils at JET is about 700 MW, of which 400 MW is consumed by the toroidal magnets. The losses in these coils are about 280 MW, which totals to energy losses of 5.5 GJ per pulse. Future fusion facilities such as ITER will use superconducting coils which will cut the losses in the coils dramatically. How much copper do the toroidal coils contain? How is the plasma initially formed from the cool material? The gaseous fuel – either deuterium or a deuterium/tritium mix – are released into the JET vessel at room temperature. A very large voltage is applied by the toroidal coil, which causes the atoms to break down, as happens in lightning: the energy strips the electrons from the nuclei , which starts a cascade of ionisation thus forming a hot plasma. Next, some careful tweaking of the magnetic fields is required (both toroidal and poloidal) to get the plasma stable, and build up the flow of the plasma around the torus. This process is known as Ohmic heating, which gets the plasma to around 20 million degrees Celsius. However to get to the 150 million degrees required for fusion, additional heating systems are then employed: electromagnetic waves (lower hybrid microwaves and ion-cyclotron) and the injection of high energy beams (neutral beam Injection). I can’t find anything about progress of how the reactor is doing, and of major breakthroughs getting close to actually getting a real fusion reactor running? Fusion research is a long term project, with a target of working fusion reactors putting electricity on the grid in about 30 years. JET is not a power station, it is an experimental device which is playing a key role in answering technical and engineering questions, such as how best do we heat the plasma, what precisely is the best magnetic configuration to keep the plasma away from the walls, or what materials are best used inside the chamber. All this expertise will be channelled into ITER, which will come on line in 2020. Final results from ITER and associated testing facilities will formulate the design of the first fusion reactors. To what temperature does the ohmic heating get the plasma? There are several ways that we use to heat the plasma – first passing a large current through it (ohmic heating) and then microwave and neutral beam heating methods. Ohmic heating schemes typically get the plasma to 40-50 million degrees Celsius. However they cannot go much further as the effectiveness of ohmic heating diminishes as the plasma temperature increases. The other methods are then used to push on to the fusion plasma temperatures we require (150 million degrees Celsius). Circa 1997 I machined 150 components from graphite for JET. Could you tell me what they would have been used for? The graphite components you worked on would almost certainly have been used to line the inner walls of the JET vessel. These walls are the first contact point with the very hot fusion plasma in JET, and need to be made from tough heat-resistant materials. Hence graphite and CFC tiles have traditionally been used. You may be interested to know that a new wall has recently replaced the carbon wall, using beryllium and tungsten tiles. Although the carbon resisted the heat well, it tended to react with the fuel, and leave deposits of dust and soot after the pulses. Operation with the new metal wall is much cleaner, and so far seems to be giving excellent results. Because beryllium is such a light metal it effect on the plasma is much smaller than carbon’s. Why do you try fusion in a vacuum when, as you all say, fusion happens in the sun not in the vacuum of space. Should you not try fusion under pressure as that is how it takes place in the sun? You are correct that fusion takes place at high pressure in the core of the Sun, and not actually in the surrounding vacuum; gravity is what holds the plasma together. Strangely enough, the sun is a very inefficient fusion reactor, producing only 1 watt per cubic metre – luckily it is very big so the total is a lot of power. Here on earth we are aiming for efficiencies a million times better than that! Plasma can exist at all manner of different temperatures and pressures – consider for example galactic nebulae, the aurora or fluorescent light bulbs, all of which are plasma. To achieve fusion within a plasma you need to have a combination of temperature, pressure (or density) and confinement – multiplying these parameters together gives a quantity that fusion scientists call the triple product. It turns out that on earth, using magnetic fields instead of gravity, confinement of plasma is quite difficult. However we have been very successful at heating plasmas – we know how to easily achieve temperatures ten times hotter than the sun! So scientists have worked out the easiest and most efficient regime for us to aim for in our terrestrial fusion reactors, and that happens to be at quite a low pressure. Part of this requirement for the vacuum concerns the relatively heavy atoms in the atmosphere (oxygen, nitrogen etc) which act as a major contaminant – interfering with the plasma to such a degree that it cannot sustain itself with even small amounts of these present. So, we can only form and sustain the plasma if we first make a very good vacuum before we inject the fuel. Once the fuel is injected and heated the pressure in the middle of the plasma is about the same as the atmosphere. How much will constructing a plant that creates fusion power cost? The next step for fusion research is the construction of the ITER, a large international fusion experiment in the south of France, ITER will test the materials, engineering and science which will enable the first commercial fusion plants to be built. The first of these is expected to cost in the region of £10 billion – roughly the cost of ITER – but, of course, it is expected that the construction cost will diminish as more and more are built. About 35 years ago I read a book about atomic energy. It said that human beings will need 30 years to benefit from fusion energy. It proved to be wrong. How long is the estimate now? We have taken enormous strides in the last 30 years, but on the way discovered fresh challenges; for example, we have made incredibly hot plasma – over 100 million degrees, ten times hotter than the sun – only to discover it’s incredibly difficult to confine it! We now have created the conditions – temperature, pressure, magnetic fields – for viable fusion, and so the task now is primarily engineering a facility to house these conditions: which will be the international fusion experiment ITER. ITER will pave the way for the first power plants, so, with sufficient political will and funding, 30 years to electricity production seems viable. What is the temperature generated in a tokamak? How can the inner wall material resist that temperature? In order for fusion to occur in the very hot gas – or plasma –created inside JET, the plasma must be heated to temperatures in excess of 150 million degrees Celsius. In order to achieve this, the plasma is actively held away from the walls of the tokamak container by using powerful magnetic fields. However, it does sometimes touch the walls: what material could withstand that temperature? The key here is that there is only a very small amount of plasma there ( ~0.1 g). So although it is exceptionally hot, this is counteracted by the very small amount, compared with the wall, which is many hundreds of tonnes in mass. Therefore the wall can withstand impact without getting seriously damaged. Earlier, carbon inner walls were employed because of their heat resistance. However, now beryllium and tungsten tiles have been installed inside JET, which do not contaminate the plasma as much as carbon. The next step fusion device, ITER, which is being constructed in France, will test blanket modules . As well as absorbing the heat from the reaction, the idea is to also wqithin the blanket breed tritium, which is rare and expensive, but is formed when neutrons bombard lithium. The design for these blankets is not trivial; it is anticipated that the lithium will be in some form of pebbles, granules or even flowing liquid, to enable the heat exchanger liquid or gas to run through and collect the heat. It is unlikely that water will be the coolant: one option is helium. I am interested to know how the internals of the machine are not damaged from the immense heat of the plasma. I am aware that there is magnetic confinement of the plasma, but does it not radiate heat? You are correct that the very hot (150 million degrees Celsius) plasma in JET is held away from the walls of the container using very powerful magnetic fields. However, if the plasma becomes unstable it can break free from this confinement and hit the walls of the container, in the process doing a bit of damage. In this case, the loss of heat to the walls causes the plasma to collapse. So why does it not melt the walls? This is because of the relative masses of the plasma and walls. The plasma weighs only ~0.01g whereas the container is hundreds of tonnes of metal. So although the plasma is extremely hot, its thermal energy content is actually quite low – as its mass is so low. Regarding radiation, there is actually not much radiation from the plasma. The deuterium is so hot that all the electrons have been stripped from the nuclei, which means there are none of the electron-level transitions that give out light. It seems strange, but the really hot plasma does not glow, and is see-through! On the in-vessel cameras it looks as though it is not there at all! A small amount of radiation from the plasma is caused by contaminants (e.g. atoms of wall material) because they have more electrons than deuterium or tritium (which have only one each). We work really hard to minimise this as much as possible – by keeping the container very clean and at a good vacuum. So, we know this radiation is not going to cause damage to the walls. What is the annual electricity consumption of the JET facility? Annual consumption is very dependent on whether JET is operational or in shutdown. The peak of consumption here is during a 300s JET pulse – where over 300 megawatts of electrical power is pulled from the grid, and up to 400 megawatts is supplied from two large flywheels located here at Culham. However, this is only for 30 seconds or so, every 20-30 minutes. How is the plasma heated, are lasers now used or are the magnetic fields in a transformer like set up still how it works? There are a number of ways that we heat the plasma. One of the main ways is using a transformer to induce a large current in the plasma (termed Ohmic heating). We also use powerful microwave systems (using the same principles as a microwave oven) and intense beams of fast neutral atoms. There is another approach to fusion altogether, which uses laser beams to compress and heat a small pellet of fuel. So-called laser-drive or inertial confinement fusion is being researched primarily in the USA and France. How is the plasma contained in the ‘cage’, is it via superimposed magnetic fields? Yes. In tokamak devices such as JET, magnetic fields are used to confine and contain the plasma away for the walls of the vessel. These are a combination of fields that the plasma creates itself and external ones applied. (painted orange) couple this field into the plasma. There are an additional six poloidal coils outside the vessel, and more coils under the divertor to shape the plasma and provide fine control. The CCFE Graduate Scheme concentrates on recruitment of engineers at present – as that is where our most acute staff shortages are at present. Of course, most of the scientists here are physicists – with physics degrees, MScs and PhDs – so your thoughts are along the right lines. It is hard to predict what recruitment will be like in the future. A more normal route for physicists is to come here to do a PhD after their degree. 28 European associations (including CCFE) collaborate on JET, many of these are universities, at which you could study plasma physics, which would lead to careers at JET, or ITER, or at the many other fusion labs around the world. Pursue physics if that is what you really enjoy – and see what is available when the time comes! You are correct that most careers here require a physics background – or some kind of engineering. It is also worth pointing out that vacancies are few and far between at present – as we go through a bit of a financial squeeze. However, there are in principle areas of our work that require chemistry expertise – in particular the crucial area of how the plasma interacts with the first wall, and the chemistry that goes on there. There are many different institutions that work on JET and ITER, so perhaps investigate those for research areas that interest you. What is the creation temperature of tritium nuclei? In devices such as JET, a gas of neutral fuel has to be heated to extreme temperatures (150-200 million degrees C) for fusion of the deuterium and tritium nuclei to occur. The neutral gas becomes plasma (where the neutral atoms are dissociated into electrons and positive nuclei) at a temperature of only a few hundred degrees C.
How can we get more energy out than in? The First Law of Thermodynamics explains how the amount of energy gained from something cannot exceed the amount put in. So it seems to violate the laws of thermodynamics – but in some ways it’s just like burning paper. Energy is released (not destroyed or created). The trade off is that the thing that is burning ends up with less energy. Just as ash and carbon dioxide has less energy than the paper did, the helium we form has less energy than the fusion fuels, tritium and deuterium. What’s even more intriguing about this is that the energy that is released is actually mass being converted to energy: the amount of mass lost can be calculated from the energy released from Einstein’s E=mc² equation. In other words the total mass of the tritium and deuterium nuclei before the reaction is greater than the mass of the helium and neutron after fusion has taken place – even though it is the same number of protons and neutrons. Why does not fusion develop faster? Any technological , monetary, political, religious barriers? The barriers for not achieving working fusion power stations are mostly technological. There are many engineering challenges to make fusion power a reality - materials that can withstand the hostile environment in a proposed fusion power station being one of the most serious. Solving these issues, so we can not only produce large amounts of fusion power, but do it economically and reliably, remains challenging. How much energy would the reaction produce in a week if kept operational? About how much of Europe could be powered by JET? This question deals with a hypothetiocal scenario. JET is an experiment fusion device and its aim is not to produce energy. So theoretically-speaking, if a JET plasma could hold onto its energy for longer it would produce a lot more fusion power and exceed breakeven. Indeed, this is what ITER – JETs international successor – will do; the larger plasma on ITER stays hotter for longer so ITER will generate ten times more fusion power than the power injected to sustain the fusion process. While ITER will continue to be an experiment and not generate electricity, a future fusion power station is expected to generate 2 GW power. To put this into context, this is enough electricity for about 3 million Europeans. What is the process of making fusion and fission happening? Fusion is the process where light nuclei are forced to stick together – making heavier nuclei and releasing energy. This is the process that make the Sun shine and in the Sun, it happens under great pressure - where the pressure in the centre is huge – and temperature. In a reactor, it will reign almost atmospheric pressure. Fusion is being investigated on JET as a way of making clean and abundant electricity in the future. Fission on the other hand is the process where heavy nuclei (such as uranium) split apart - forming smaller nuclei and also releasing energy. This is how present nuclear power stations operate. Since energy cannot be destroyed, would it be possible to use utilised energy? This is correct, energy cannot be destroyed – but it can be converted. We are rapidly converting the energy for fossil fuels into heat, light, petrol etc and then we use it i.e. it is converted into kinetic energy with transport; radiation (heat and light etc) and is dissipated as it does so. Eventually we will make more fossil fuels, but it took millions of years and we are using energy over hundreds of years. Could helium be used instead of hydrogen? All small atoms are capable of fusion – indeed fusion in stars at the end of their lives will result in heavier and heavier atoms being formed until you reach Iron (Fe) which has 56 protons and neutrons. In the case of helium, the triple alpha process fuses three helium nuclei to form beryllium and carbon. How are waste materials removed? In the fusion process the energy will be gained using the two isotopes of hydrogen: deuterium and the radio active tritium. That way the main by-product in a future power station will be helium – a non-radioactive gas which will be pumped out of the vessel and store on site. As a result of the process radio-active elements will be in the wall tiles and other components that are activated by retention of tritium and the impact of neutrons on the material surfaces. If they need to be replaced they will be removed by remote handling techniques. Techniques which have been developed in JET since operation started. Typical decay times for activated components are less than 100 years. I’m very interested in plasma physics and studying in Great Britain. Which University is active in the field? What kind of qualifications would one need for a career in fusion? Almost all scientists in fusion research have physics degrees – many pursue doctoral and post-doctoral research– often at a Fusion Association as well with partner universities. Engineers in the field are more varied – electrical, mechanical – some civil, control. Apart from these fusion research also employs IT professionals. Those interested in pursuing a career in fusion should check out the FuseNet website. Fusenet closely collaborates with EUROfusion and provides a platform for the coordination of European fusion education activities. One core function of EUROfusion is to co-ordinate the training and education activities for European fusion research and it supports PhD and pre-doctoral candidates working on fusion research and has established EUROfusion research and engineering grants to fund the training of approximately 30 engineers and scientists every year. Using nuclear fission and fusion for generating electricity requires very different technologies and engineering. 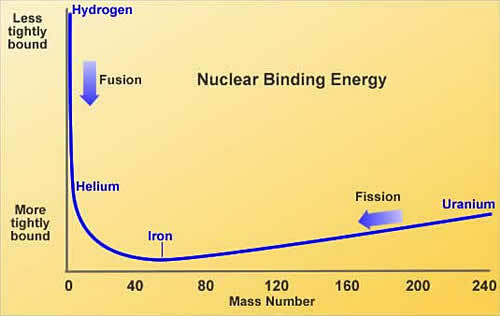 With fission, the splitting of heavy nuclei (uranium, plutonium) happens quite easily – and most reactions accelerate (i.e. produce more neutrons for splitting more atoms per reaction). So harnessing fission (in conventional nuclear power stations) needs engineering to moderate the reactions and safety systems to cope with accident scenarios. Fusion is quite different. Forcing light hydrogen-like nuclei together does not happen at room temperature – indeed we need to exceed the temperature at the centre of the sun to make it happen (100 million degrees Celsius). For us, the challenge is creating a very hot gas of fuels, controlling and confining it and getting the fusion reactions started. This is why fusion is still in the research and development phase – and fission is already making electricity. How do both fission and fusion generate energy? Fission is the splitting of heavy nuclei (such as uranium) – in two smaller nuclei. This process needs less energy to ‘bind’ them together – so energy is released. Fission happens quite easily – and is used to generate electricity in conventional nuclear power stations. Fusion on the other hand, is the process of sticking together light nuclei (typically hydrogen-like nuclei). The larger nuclei again needs less energy to hold it together – so energy is released. This is what happens in the Sun and stars, and research on how to harness fusion energy on Earth is being carried out in devices such as tokamaks and stellarators. While it might seem confusing that energy can be generated by both fusion and fission , as they appear to be quite opposite processes, the explanation lies in the size of the nuclei. Light elements, such as hydrogen and helium, have small nuclei that release lots of energy when they fuse together. Moving to heavier atoms, less energy is released in each fusion event; until, at iron (26 protons and 30 neutrons), no more energy is released by fusion. Any bigger, it takes energy to make fusion happen. Atoms with really huge nuclei, such as uranium and plutonium do the opposite of fusion: they release energy when they break apart. What are the main methods used to heat the fuel to the temperatures necessary for fusion to occur? 2. Researchers also use powerful microwaves, whose frequency is tuned to the rotation frequency of either the electrons (GHz) or the nuclei (MHz). 3. Finally, powerful accelerated beams of particles are used. Researchers focus and accelerate beams of nuclei – then neutralise them so they can penetrate the tokamak’s magnetic fields. A combination of all these methods gets us up to the plasma temperatures needed in tokamak experiments. How are alpha particles produced and how dangerous are they? An alpha particle is produced by the alpha decay of a radioactive nucleus. Because the nucleus is unstable a piece of it is ejected, allowing the nucleus to reach a more stable state. The piece that is ejected is the alpha particle, which is made up of a two protons and two neutrons: this is the nucleus of the helium atom. Helium is an inert and harmless gas, so the particles are not dangerous in themselves, it is only because of the high speeds at which they are ejected from the nuclei that make them dangerous. At these high speeds they have enough energy to break bonds in matter or ionise atoms (knock electrons off), which is especially deleterious for living cells. An interesting thing about alpha particles is that they do not penetrate far through matter (unlike beta or gamma radiation). They are stopped by paper! Therefore an external source of alpha particles ( or alpha radiation as it is called, for historical reasons, even though we now know they are particles) is not a big concern for humans. Of course the alpha particles, while not penetrating far, deposit their considerable energy in a short distance (i.e. the piece of paper that stopped them absorbs all the energy). Hence, while our epidermis, the outer layer of our skin, is basically dead cells and so is not damaged by alpha particles, ingesting an alpha emitter, thereby giving it access to our internal organs would be a concern. In fusion, helium/alpha particles are produced by the fusion reaction, along with neutrons. At JET we use magnetic confinement to contain the fusion reaction – because the helium nuclei are charged, they are confined by the magnetic field and do not escape. At the end of the experiment, when the magnets are turned off, these helium nuclei collide with the walls ( which are thicker than paper!) recombine with some electrons, and return to being ordinary helium gas. Note that the fusion reaction only continues to happen while the experiment is turned on – if the experiment gets too hot or cold, or gets too little fuel or too much then it stops. It is not like a spontaneously radioactive element (such as Americium-241 or Polonium-210). Would fusion electricity cost increase or decrease? And why? Nobody knows the cost of electricity from other technologies (gas, coal, renewables, fission) when fusion comes onto the grid in 2050 or so. But, predictive codes are suggesting that the cost of electricity from fusion will be competitive with other energy sources. It is impossible to be more precise than that. Could a Deuterium-Tritium fusion process breed enough Tritium from Lithium to sustain itself? In terms of Tritium breeding, it is suggested to produce enough Tritium from neutron absorption in the Lithium blanket, though this is yet to be fully tested (ITER will have various test blanket modules). How much time is required to heat up plasma? In JET Europe’s largest fusion device, going from plasma formation to steady state density and temperature takes about 4-5s. This may be longer on future power plants – but as there is not much plasma to heat up, it is quite quick. Would a sustainable Deuterium-Deuterium (D-D) fusion reaction require much more energy compared to Deuterium-Tritium (D-T) fusion? JET, so far the only operational fusion experiment capable of producing fusion energy, is routinely operated with Ddeuterium only, for a number of reasons. This minimises activation (from D-T neutrons and formfrom Ttritium retention in walls etc. ), enabling to upgrade JET easily and minimising decommissioning issues at the end of JETs operational life. They operate in Ddeuterium only to investigate the feasibility of D-D fusion – very much concentrating on D-T fusion in ITER and the first true powerplantspower plants. Why then not get D-D fusion occurring at high levels in JET ? Because D-D needs much higher temperatures of 400 – 500 million degrees C than can normally be achieved. Already – plasma temperatures of 150 – 200 million degrees C will enables lots of D-T fusion – but not very much D-D fusion. The helium produced from fusion in a future power station would be used in the overall design. Most notably, converted into its liquid form, liquid helium will be used to cool the superconducting magnets or in the main thermal cycle, as a heat exchanger medium. How will fusion energy impact the environment? One of the most attractive prospects of realising fusion energy is that it will be a low-carbon energy source. It would not contribute to global warming because it produces energy without emitting damaging greenhouse gases such as carbon dioxide and methane. Moreover, the amount of fuel required to produce energy from fusion is extremely low. A 1 GigaWatt fusion plant will need about 100 Kg of deuterium and 3 tons of natural lithium to operate for a whole year, and it will generate energy of about 7 billion kilowatt-hour, with no greenhouse gas or other polluting emissions. A conventional coal power plant, on the other hand, requires about 1.5 million tons of fuel for generating the same amount of energy and its by-products include about 4-5 million tons of CO2. Unlike fission plants, fusion will not generate long-lived radioactive products. The level of radioactivity in a low activation fusion reactor at 1 year and at 100 years after shutdown is calculated to be about one-millionth of the radioactivity in a fission reactor of the same power. What is the triple product? DEMO, the demonstration power plant, will be the successor of ITER and the next step on the way to realise fusion energy. Its purpose is to develop and test technologies, physics regimes and control routines for operating a fusion reactor not as a scientific experiment, but as a power plant. One of the key criteria for DEMO is the production of electricity (albeit not at the price and the quantities of commercial power plants). ITER is the key facility of the EUROfusion roadmap, and EUROfusion allocates considerable resources to ITER and its accompanying experiments. The second phase of the roadmap is focussed on maximising ITER exploitation and on preparing the construction of DEMO. Building and operating DEMO, which will hook fusion electricity to the grid, is the subject of the last roadmap phase. n fission, energy is gained by splitting apart heavy atoms (uranium), into smaller atoms (such as iodine, caesium, strontium, xenon and barium, to name just a few) whereas fusion is combining light atoms, (in current experiments two isotopes of hydrogen, deuterium and tritium), which forms a heavier one (helium). Both reactions release energy which, in a power plant, would be used to boil water to drive a steam generator, thus producing electricity. Remote Handling enables an operator to do manual handling work at a particular work site without being physically present at that work site. Unlike conventional robotics, Remote Handling always involves a human being within the process. The main handling device is a manipulator, not a robot, because the majority of Remote Handling tasks need the intuition and intelligence of a human being. The Remote Handling system used for maintenance at the JET nuclear fusion experiment includes robotic devices, advanced computers, virtual reality, television and a wide range of specialist tools. The technological expertise required of the personnel to design and operate these types of systems covers mechanical, electrical and electronic engineering, software, real time control, ergonomics, pneumatics, hydraulics, welding and cutting. Why is international collaboration so important to fusion? The simple answer is that the challenge of developing fusion so it puts electricity on the grid is enormous – and big challenges tend to need wide multilateral / international solutions (e.g., the international space station, CERN, which is a European particle physics experiment etc.). Some even consider fusion research the biggest challenge of all – in heating a gas of fuels to 200 million degrees C so fusion of the nuclei occurs, building the reaction chamber of materials that can withstand the harsh conditions, developing robotic maintenance systems etc. This needs a joint effort from many countries, so ITER has 7 international partners China, the European Union, India, Japan, Korea, Russia and the United States. And the ITER members share of the cost of project construction, operation and decommissioning, and also share in the experimental results and any intellectual property generated by the project. Twenty years of collaborative research experiments are planned on the machine.